Want to connect with Venessa? Save Now take advantage of this limited time deal. "New year New Start New Color's"
If you want the job done right then we are the ones for you. Here at EIN we give great quality of work it shows in our work once it is done. We show up when we say we are going to be there, and we hold. Feel free to give me a call so we can schedule an appointment. I am one who will work with you I get in and I get the job done, an we clean up like we were never there. 1 Room deal $65.00 Special with trim. Trim work we can negotiate depending on the size of space. This is all without paint included if you would like for me to give you an estimate with paint included fees will vary depending on the Name brand of paint. I am just being honest as we all know It's not just about the name it's also about the quality of paint :) an choosing the right sheen for each room in your home or place of business. We also provide pressure washing services at very great low prices an have package deals. Call or text to see what fits you best. Call before March 1 2017 an you can receive 1 mth free Pressure Washing touchup you pick the mth. Thank you for taking the time to look over what we have to offer. Remember always look around for good deals that fit your needs but also remember that the cheaper you go the cheaper the quality in the work at the end once it's done. If you are going to get a project done make sure you get it done once. Painting crew ready to transform structures into art! 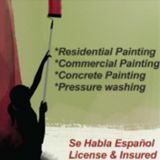 Licensed and insured painter with over 10 years of experience. Professional work.